The ‘Snowman’ of Horncastle certainly doesn’t melt in the summer sun – in fact, quite the opposite as he is preparing for another champion sporting effort this July. Dad-of-two Luke Crossland is in training to take on a half Ironman challenge, which is far from the norm. 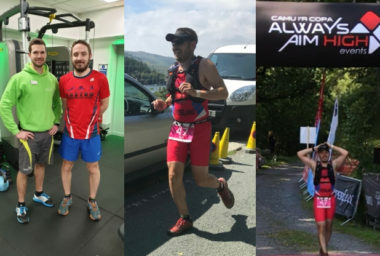 Called the ‘Always Aim High Snowman Legend’ event, the sporting effort involves a 1,900km swim, a 92km bike ride and a 21.2km run – with the run including the 2860ft mountain of Moel Siabod in Snowdonia. This is the second year Luke – a teacher by day – will be facing one of the ultimate challenges of its kind, and he is hoping to beat his current time of 7 hours and 34 minutes, which was achieved in 2018. As a young boy, Luke was a talented footballer and spotted by Cardiff City – he was invited to a trial at the club when he was 14. “However, when that didn’t happen, I concentrated on my education and University life saw me drop sport for a while,” recalled Luke. Luke first tried a sprint triathlon in 2008 but only did the one with minimal training. However, following the birth of his first child, Luke decided to pick up the training again and took part in another triathlon in 2015. It was here that he caught the triathlon bug. “That was it, I was hooked,” said Luke. A regular ‘pay-as-you-go’ visitor to Horncastle Pool & Fitness Suite, Luke took the plunge and signed up as a member – and it has been a revelation. “I can honestly say I have not looked back. Being a member turned out to be cheaper as I had use of the pool and the gym. When I first started, I would use the gym for training in the winter and go outside during the summer. However, I started to notice niggles here and there and it was because I was not keeping the gym work going – and restarting all year round has made all the difference,” added Luke. Along with Lifestyle Consultant Dave Anderson, Luke now has a proper fitness programme and has several races before the big Snowman push at the end of July. Fitness members can book classes online, 7 days in advance. Be the first to hear about the latest news, events, discounts and much more by signing up to our newsletter! Get involved on our social media channels to stay up to date, keep in touch & give us feedback. Have you signed up for an MV Card, which provides discounts of at least 10% on activities at our leisure centres? © 2016 Magna Vitae is a company limited by guarantee registered in England and Wales. Registered number 09078400. Registered offices: Meridian Leisure Centre, Wood Lane, Louth, Lincolnshire LN11 8SA. VAT Registration No. 318 6820 89.